A flexible solution for managing your staff leave, absence and other out-of-office times. Staff can submit leave requests though the system and approvers can be notified by email and respond accordingly. When processing a leave request approvers can quickly view the calendars to determine whether to approve or decline. The custom report builder lets you review your staff holidays and absences over any period of time. Optional features such as accruals and carryover enable you to have the system automatically accrue leave over a period of time, or restrict the use and amount of carry-over. You can allow managers to submit leave requests on behalf of their team members as well. 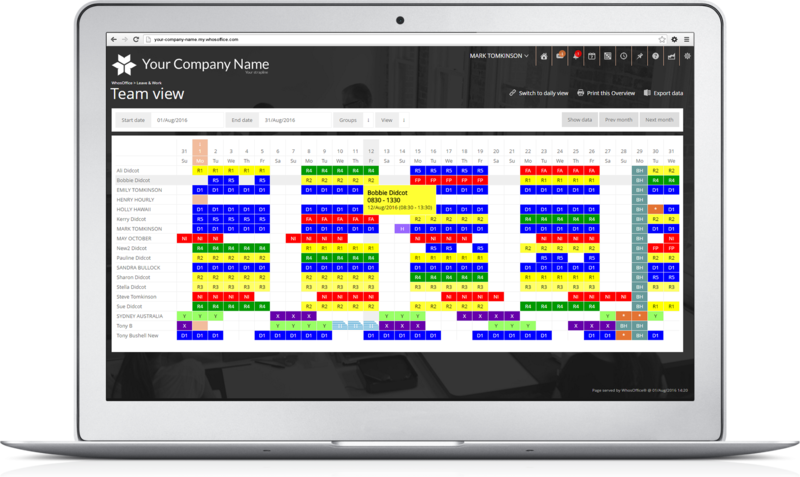 At a glance, view your team / department leave (or whole company) by month, or by day including working times and even localised International times. There is a combined view of Leave and Work giving you a detailed overview of where you staff are.